In recent times, there have been aggressive moves by the regulatory authorities towards closer monitoring and maintenance of leachate collection systems to help validate that intended construction and operational criteria are being met. Jetclean America has over 20 years experience in leachate collection system maintenance, working throughout the Southeastern USA. 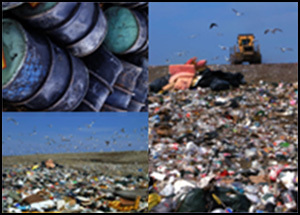 We provide both routine scheduled maintenance and emergency coverage to over 150 landfills. Operating permits, when issued, interpret general state requirements, and depending on local conditions and management policy, may also stipulate stricter specific maintenance requirements. In many states, in line with good engineering practice, it is now common practice that leachate piping be jetcleaned annually and video inspected routinely. Typically, liners (where installed) are designed to handle a head pressure of 30cm or 1 foot. Clearly, if the leachate drain system is not functioning in terms of its design criteria, there will be environmental exposure. Underdrain collection systems in slurry wall systems must also function within appropriate parameters. Biomass growth, over even a 12 month period can reduce leachate flows by up to 50% through perforation clogs and pipe blockages. This is evident from Jetclean America actual experience at those sites with annual maintenance programs. It is important that the system design allows jet cleaning against the flow in order to ensure debris is pulled back into the header system where it can be further jetted back to the pump station and removed. Where jetting can only be carried out in the direction of flow, the system cleaning has to rely on gravity to evacuate debris. This is considerably less effective and the quality of subsequent video inspection will reflect this. Video camera systems can be either motorized tractor mounted or skid mounted and pushed by hand. Generally tractor utilization is limited to manhole, pump station, or 8”+ cleanout access and has a 1,000'+ range, while push type systems can be used in smaller pipes from nearly any available access but are limited to a 500' maximum range. OSHA requires that electrical equipment used in a leachate collection system, where there may be concentrations of explosive gases, complies with the National Electrical Code Section NFPA 70. As such, video-inspection equipment used to televise leachate pipe condition must therefore meet the requirements of Class 1, Division 1 Gas Groups C & D certification levels. Each component of the video inspection system must be certified compliant (in layman terms this means "explosion proof"). All Jetclean America equipment is compliant. Standard municipal and commercial video inspection systems are not generally certified to this level and the use of non compliant equipment exposes the service provider and the landfill to OSHA fines, possible damage to the landfill, and potential landfill and contractor liability in the event of an explosion. This is the base point at which planning and design determine amongst other things, the manhole/cleanout accesses into the leachate system and thereby establish system cleaning/video inspection parameters. Many existing older landfills gave inadequate consideration to this aspect and standard permit compliance in terms of maintenance needs simply cannot be observed. There is no need for this to happen in new design construction where the above maintenance requirements (as limited by equipment technology) have been taken into consideration. 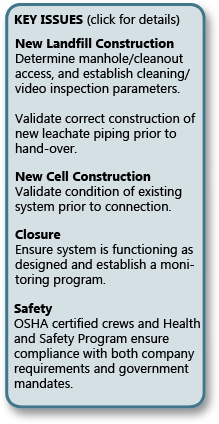 An important and key point is the need for validation of the correct construction of new leachate piping, carried out by video inspection PRIOR to hand over and commissioning of the new cell. This ensures that meaningful leachate flow measurements are available right from the outset and eliminates some of the problems often undiscovered until some future time e.g. crushed or split pipe, separated joints, closed valves etc. It is relatively easy to apportion responsibility and initiate repair action at time of construction prior to contractor hand over. Problems which only become apparent after the cell has been active for a period of time may require quite potentially very costly repair work which has to be borne by the owner. Some relief can also be provided by building redundancy into the drain system design. When a new Cell is constructed at an existing landfill, the above equally applies, but where the new cell leachate drains into an existing leachate system, it would also be appropriate to validate the condition of the existing system prior to connection. As part of the closure process, the leachate collection system should be cleaned and inspected to ensure it is functioning as designed and that a monitoring program be established to review the situation on a routine basis. All Jetclean America crews are OSHA certified as appropriate. The company has a Health and Safety program in place to establish standards for personnel and job procedures to ensure compliance both with Company requirements and mandated Government needs.